The 2003 Rugby World Cup was the fifth Rugby World Cup and was won by England. Originally planned to be co-hosted by Australia and New Zealand, all games were shifted to Australia following a contractual dispute over ground signage rights between the New Zealand Rugby Union and Rugby World Cup Limited. The pre-event favourites were England, regarded by many at the time as the best team in the world after defeating all of the traditional southern hemisphere teams and also after winning the grand slam in the 2003 Six Nations Championship. New Zealand, France, South Africa and defending champions Australia were also expected to make strong showings. The tournament began with host nation Australia defeating Argentina 24–8 at Telstra Stadium in Sydney. Australia went on to defeat New Zealand 22–10 in the semifinal, to play England in the final. Along with a try to Jason Robinson, Jonny Wilkinson kicked four penalties and then a drop-goal in extra time to win the game 20–17 for England, who became the first northern hemisphere team to win the Webb Ellis Cup and become world champions for the first time. The following 20 teams, shown by region, qualified for the 2003 Rugby World Cup. Of the 20 teams, eight of those places were automatically filled by the teams that reached the quarter-final stages in 1999, including hosts and world champions Australia and did not have to play any qualification matches. A record 81 nations from five continents were involved in the qualification process designed to fill the remaining 12 spots, which began on 23 September 2000. Australia won the right to host the World Cup in 2003 without the involvement of New Zealand after a contractual dispute over ground signage rights between the New Zealand Rugby Football Union and Rugby World Cup Limited. The overall stadium capacity was reduced from the 1999 Rugby World Cup in Wales. The Adelaide Oval underwent a A$20 million redevelopment for the 2003 Rugby World Cup, financed entirely by the South Australian Cricket Association, with two new grandstands built adjacent to the Victor Richardson Gates. The Suncorp Stadium was a new A$280 million venue designed specifically for rugby, and was opened just before the start of the 2003 World Cup. The Central Coast Stadium was also a newly built venue, and opened in February 2000 at a cost of A$30 million. Aussie Stadium was one of two venues in Sydney that were used for football during the 2000 Olympic Games. The other venue in Sydney was the Telstra Stadium which was the centrepiece of the 2000 Olympic Games. Formerly known as Stadium Australia, Telstra Stadium was built at a cost of over A$600 million and was the biggest stadium used in the 2003 World Cup. The only stadium with a retractable roof used was the Telstra Dome in Melbourne. A total of 48 matches (40 Pool Stage & 8 Knock-out) were played throughout the tournament over 42 days from Friday 10 October 2003 to Saturday 22 November 2003. The opening game at Telstra Stadium between Australia and Argentina. The ARU's main promotion for the event was "Show Your True Colours". The Australian media criticised the competition early in the tournament as the smaller nations were crushed by the rugby superpowers by 60 points or more. However, some of these smaller, third tier nations, such as Japan, acquitted themselves well in their opening matches. The South Pacific island countries of Fiji, Tonga and Samoa were reported as being handicapped as several of their key players who play abroad being warned by their clubs that their contracts would not be renewed if they played in the competition. In the event, the group stage of the competition played out largely as expected, with some tension as to whether some of the "developing" nations would overtake some of the weaker major countries for the second quarter-final qualification place in each pool – in pool A, Argentina lost to Ireland by only one point, which would otherwise have carried them into the quarter-finals in Ireland's place; similarly in pool B Fiji lost to Scotland by only two points, while Italy put up a good performance in pool D. In pool C, Samoa gave England a fright with an adventurous approach that allowed them to take an early lead, however, England's superior fitness saw them through. This match was marked by controversy, as England fielded 16 players at one point during the game, coinciding with a last-gasp try-saving tackle, which may have won the game for the Samoans. The big clashes ran mainly to form. A disappointing South Africa limped through the pool, eventually capitulating to England to relegate them to a difficult quarter final against New Zealand. Australia however only beat Ireland by one point to top their group, whilst Wales pushed the All Blacks to the wire, after adopting an outgoing style of play with a fringe selection. France beat Scotland to round out the quarter-finals. The knock-out quarter-final stage produced the widely predicted set of semi-finalists, although England again made heavy weather of defeating a resurgent Wales. England were widely rated the world's best team, but they struggled against a Welsh side full of belief after their game against New Zealand. France destroyed an Irish side who had gone into the match hopeful of a win, scoring 31 early points to put the game out of reach. In the other quarter-finals, a disappointing South Africa fell to New Zealand and Australia defeated the Scots. The second semi-final saw France face England. The boot of Jonny Wilkinson was the difference between the two sides, with England coming out victors. 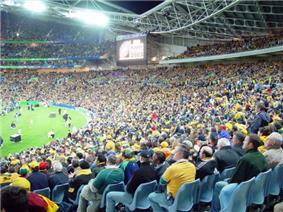 The final between Australia and England was played at Sydney's Telstra Stadium in front of a crowd of 82,957. Australia opened the scoring after they decided to run a penalty instead of kicking for touch. Lote Tuqiri beat England's right wing, Jason Robinson, to a high cross-field kick and went over for the first try, but Elton Flatley was not able to add the conversion. The rest of the half was a tight affair, with England edging in front from applying pressure and Jonny Wilkinsons boot put them up to a 9–5 lead after Australian indiscipline gave away several penalties, but were unable to capitalise on their territory. Towards the end of the first half, England stretched their lead further. Lawrence Dallaglio made a break and popped the ball inside to Jonny Wilkinson, who drew the defence before putting Robinson away in the corner for a try. The conversion was missed, but England went in at half time leading by 14–5. In the second half Australia tightened their discipline, and solid play forced mistakes from England. The game swung from end to end, with both sides having try-scoring opportunities, but neither able to take them. Australia managed to get points on the board and Elton Flatley scored two penalties to make the score 14–11 to England. In the 79th minute, Australia were putting pressure on England in their half, and Australia were awarded a penalty right before full-time, with the potential to tie the scores. Flatley converted it to make the score 14–14 and take the game into an additional 20 minutes' extra time. England opened the scoring in extra time with another Wilkinson penalty, but with two and a half minutes of extra time remaining Australia were awarded another penalty, which Flatley kicked successfully. With 20 seconds left before sudden death, Wilkinson scored a drop goal to win the match and with it the world championship. Three days after the final, the new World Champion England team landed at Heathrow Airport in the early hours of the morning, emerging from their plane to a huge reception, despite the time. On 8 December a national day of celebration took place in the form of a massive victory parade in the streets of London. This remains the biggest winning margin in Rugby World Cup history. Andy Miller's drop goal, at 52 metres, remains the longest in Rugby World Cup history. See also: 2003 Rugby World Cup drop goal scorers. ^ Devlin, Martin (10 May 2009). "Cup won't be empty for three more years". ^ BBC Sport (25 November 2003). 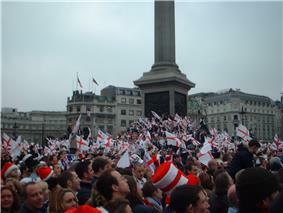 "England rugby heroes arrive home". BBC. Retrieved 7 June 2006. ^ "Visa International Renews Rugby World Cup Partnership". corporate.visa.com. Archived from the original on 27 April 2006. Retrieved 25 April 2006.